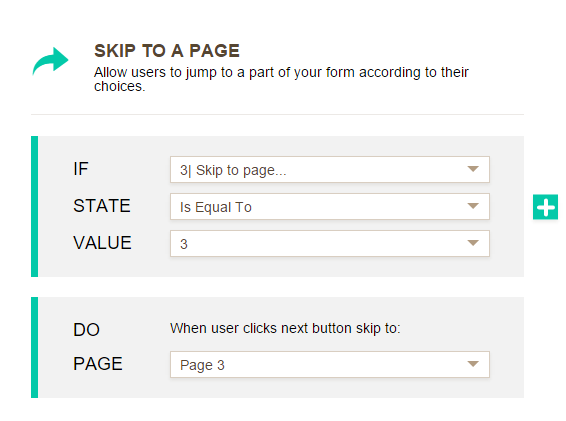 In this guide, you will be able to use conditional logic to skip pages based on user's form field input. First, you'll need to be familiar with the "Conditions", please check this link for that guide. Here's a sample form that I made: https://form.jotform.com/53531357542959. It skip to pages depending on the drop down field selected. Below are the steps on how I have setup mine. 1. I will add a drop down field that will be used as the basis for the skipping of pages. But you can use other form fields like text boxes, radio buttons, etc... Depending on how your form works. 2. Make your form multi page by adding page breaks. 3. Click "Settings", then select "Conditions"
4. Select "SKIP TO / HIDE A PAGE"
6. Repeat the same steps for the other pages, depending on how you want it to work. I hope that helps. For questions, feel free to leave us a comment below. Is it possible for this function still to work if you're using form tabs widget? We have a 15-17 page form and would like to have tabs in there as it collects a ton of data and we like to give people the option to go backwards/toggle tabs to ensure each page is filled out correctly prior to submitting. I am noticing though, that when certain pages are conditionally set to be hidden, the form tabs are removed however that page's content still appears. I have a third (last) page with optional questions. I want to hide this page if the user selects "No" to my questions asking if they want to respond to some optional questions. I set up the condition to hide the 3rd page if they select "No" but even after I click on the next button, it still shows the 3rd page. How do I do this so when they select "No" they will just get prompted to submit? I am creating an order form where I want to hide pages depending on the product selected. I have created a drop down box with the different products and have each products selections on a different page. I have set the conditions to hide the pages I don't want shown when particular products are selected, but it seems that if i have more than two conditions the pages don't hide. bUENAS REALMENTE LO QUE OCUPO ES QUE DE UNA PAGINA AUTOMATICAMENTE ME PASE A OTRA SIN NECESIDAD QUE QUE SEA UNA PREGUNTA OSEA QUE LA PAGINA 10 ME PASE A LA 12 Y NO QUE ME PASE A LA 11 QUE ASI ES COMO YA VIENE POR DEFAUL. Is it possible to hide multiple pages? My form's conditional logic isn't working on Safari on mobile. Is it just a web feature? When I use conditional logic to skip from the fourth question to the last two questions of a 40-question survey, it shows the 'previous' option on the bottom left...and it sends the individual back to question 38 (which he hasn't seen) rather than question 4 (which was the last one seen). Is there a setting I'm missing that would prevent this? Hi, is it possible to link to a certain page in the url? For example I want to have an external link that links to page 3 of a form. i created a dropdown that lists all 18 pages on page 1. i followed the steps by creating the Conditions for each selection. Is this an option that's only available for paid plans? I've set a condition to hide certains pages if a field has a certain value: If the field "numbers of events" is set to "1" then Hide pages 3, 4 and 5; if it set to "2" then Hide pages 4 and 5, and so on. The problem is that if some fields in a page has been filled by a user, and after that he or she changes the value so that the page is hidden, the fields which have been filled are not cleared and they appear both in the notification message and in the autorespond message. Is it possible to fix this situation in some way, maybe adding other conditions? Is this function only possible in paid forms? I'm trying to test it out now on my free form and it wont work? I have set a condition to hide a page (containing multiple question fields) if either of two conditions are met yet one of the fields presents even when both conditions have been met. Why might that be? I'm trying to send a comment but I'm getting an error Slow down you move too fast?? Is it possible to hide multiple pages with one condition? if you choose "shipping items" it should go to the "shipping items" page, it's not. It's the same for all answers to "how can we help?" 2. Once you've gone to your dedicated page based on #1, each page should submit and go to the end. You can only submit one kind of request per form, so there should not be a "next" or "back"
How do you hide the "next" button? I found it in page break properties/advanced, but it's not working. can you name the pages instead of working with them as numbers? I am trying to skip to the end of my form (page 13) if someone answers anything but "Yes" on my first question. It isn't working. Can you help? Form is @ https://form.jotform.com/solutio/psr-form. I am trying to hide pages as well as skip. I see that it is an option under the conditional logic, but I can't seem to get the tab hidden. Any experience hiding a tab or special tricks? I have created a drop down box that has multiple options (page 2, 3, 4 etc). I added a condition to skip to page 2 when page 2 is selected, and then added another condition to skip to page 3 when page 3 is selected on the drop down menu. But no matter which page I select it only goes to page 2. Is there another condition I need to add? Is possible set a condition for the back button too? This is great, however, how to I get the next button not to move to the next page unless they click the conditional logic answers in the drop down or radio buttons about the back and next buttons. Can I turn off the next function unless the logic is selected? Can I use this feature for skipping a question and redirecting a respondent to other questions based on their response?